So, Rocket Internet, the clone factory, also has the reputation of being an entrepreneur factory of sorts. The leaders of its startups are a sought after bunch because of their experience gained from a global company known for relentless focus on delivering results by whatever means. TechCabal dedicated an article to tracking where ex-Rocket Nigeria CEOs are now and in the post they reveal that Econet Wireless hired James Gibson the former MD of Hellofood, Rocket’s food delivery startup. 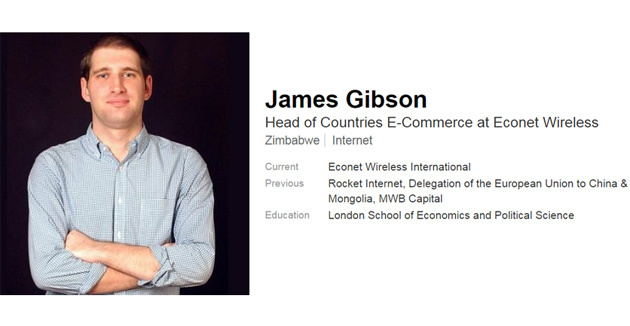 He is now heading a division more and more visible at the Econet group, especially in Zimbabwe, e-commerce. He started at Econet in January this year which makes him the guy that launched recent products like EcoShopper. Onwards we should expect more e-commerce and marketplace launches by his team. Expect also more tying up of these e-commerce products with other Econet services like apps preloaded on smartphones the operator sells, and even zero rated apps and websites. Mobile operators looking to other non-telecoms services to make up for a declining voice stream has been happening for a while. Where telcos like MTN have chosen to invest in startups and investment companies that are already focused on these areas – MTN has marketplace startups in Zimbabwe via its joint venture with Rocket Internet and Millicom – Econet has chosen the route of creating internet companies, and now, apparently, hiring from the biggest and meanest of those already working at such startups. Which srategy is more effective? Time will tell. My opinion is ofcourse that an investment approach into an independent startup – as opposed to birthing the e-commerce ventures inside a huge political monster the size of Econet – delivers better results faster. But I have no idea how this is structured on the inside, that is how independent Gibson’s teams will be to execute fast, so i can only hope. Having been at a clone factory, Gibson probably finds Econet is a type of factory that also clones. EcoCash implementation has followed closely the footsteps of M-Pesa in Kenya. They have made it clear that, like Rocket, they also believe when it’s been done before, precious time shouldn’t be wasted on re-invention – rather just go to the world’s best, take what they are doing and implement it to the letter in your market, and then later later, as local market realities dictate, iterate and even pivot. Ever since visiting the US, i’ve been wanting to experience e-commerce here in Zim. I am now excited to see what services Econet plan to launch. Lets hope they can FINALLY kick start online retail in Zim! Good luck to them. Does anyone know how well MTN/Lamudi and the other foreign-based online businesses are faring locally? Their reach seems to be as far as the discussion in the tech community and not outside. How is Zim a whole nother ball game?